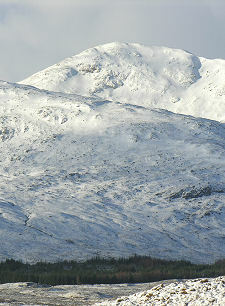 It's been said that the mood of the Scottish landscape depends on the weather more than anywhere else on Earth. 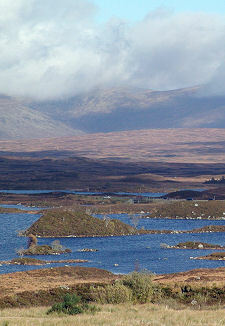 And Rannoch Moor is probably the most extreme example of that. Imagine a triangular area, stood on its apex, about 10 miles across its base and about 10 miles from top to bottom. Imagine that this 50 square mile inverted triangle is a roughly level plateau that sits at an altitude of a little over 1,000ft. 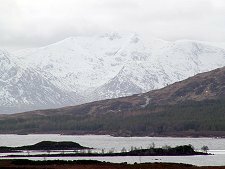 Imagine that its surface is dotted with innumerable lochs, lochans, peat bogs, and streams; that it is surrounded by mountains that rise to over 3,000ft to the south-east and the west and to over 2,000ft in the north. And, finally, imagine that this area is crossed by a railway line, running a little inside the south-east side of the triangle, and a single road, running a little inside the south-west side of the triangle. Congratulations: you've just invented Rannoch Moor. 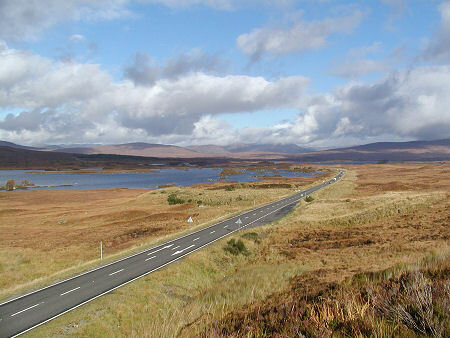 Most people first see Rannoch Moor when driving north from Bridge of Orchy. Near Achallader the main road and the railway line diverge and the road makes a sweeping climb up to the Rannoch Moor plateau. What you find there can be a glory of heather and lochan surrounded by distant mountains. Or it can be a grey cloud-shrouded landscape through which you catch occasional glimpses of an other-worldly landscape. 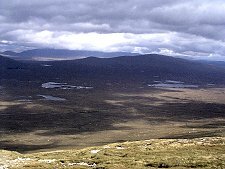 If Achallader marks the southern apex of Rannoch Moor's triangle, then the other two are equally distinctive. 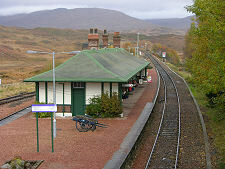 In the north-east lies Rannoch Station and the end of the public road in from Pitlochry, 40 miles to the east. 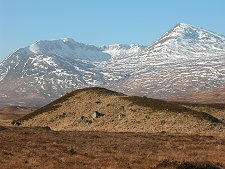 There is no way of crossing Rannoch Moor from east to west except on foot, and a ten mile track links Rannoch Station with the Kings House Hotel on the A82. Remember that you will need to walk back: the shortest route by public road from Kings House Hotel back to Rannoch Station is over 100 miles long. 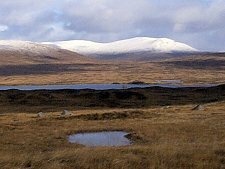 Rannoch Moor is also crossed from south to north by the West Highland Way, bringing its steady stream of weary walkers across this remarkable landscape. They conclude their crossing at the third, north-west, apex of the triangle formed by Rannoch Moor, where it comes to an abrupt conclusion in the jaws of Glen Coe. Here the junction with Glen Etive is spectacularly marked by the rocky pyramid of Buchaille Etive Mor. 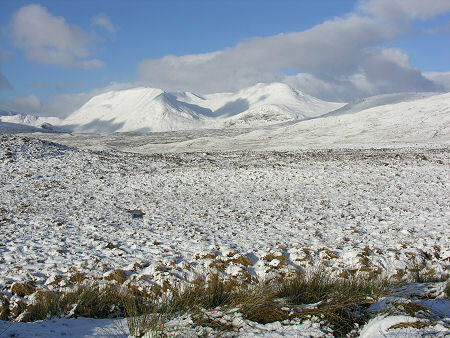 You can look at Rannoch Moor as a place of wonder, one of the last really wild places in Scotland. Or you can take Robert Louis Stevenson's view in the novel Kidnapped: "A wearier looking desert a man never saw". He clearly caught it on a dreich day.